In October, Canada had the amazing sounding "After Eight Pies". As a kid After Eights were my absolute favourite chocolate, my grandparents would always keep a box in the fridge for me when I visited. I loved any other Mint + Chocolate combination, like a Mint Chocolate Orange, or Aero Mint bar or even Mint Chocolate Chip ice cream. To this day I still love Mint together with chocolate, and when I read that Canada was getting an After Eight Pie I asked my mother to buy me the and stick them in the freezer for me until I came back to visit at Christmas. I had to remind her a couple of times but she eventually did it, and I'm glad she did, because it wasn't available when were were there, the promos in Canada only run for about a month. She's flown Pies to Singapore for me before, so this was hardly a strange request for her. What was more strange is that I decided to have these pies on Christmas morning. My wife and I were flying out to visit my grandparents on Christmas evening, and I had forgot that my mother had these until the morning we were leaving. Since they were frozen solid, I stuck one in the microwave for only about 20 seconds. The photos you see here are after I had heated it up. It wasn't steaming when I took it out, and the crust wasn't all that hot to touch, it was cool enough for me to pick up, break in half for a photo. Since it didn't seem that hot, I didn't think anything about sticking half the pie into my mouth all at once...that was until the mint filling touched my tongue...it was like I just bit into a pie filled with lava! The mint filling was so hot it burnt not only my tongue, but the roof and all sides of my mouth, and they were sore for at least the next 4-5 days. I don't know what this stuff could have been made of to conduct heat so well...Since I microwaved only one, I rushed to take a bite of the still frozen 2nd pie I had to cool try and cool down my mouth. Once the burning subdued, I took a cautionary 2nd bite of the still deceptively looking hot pie. The mint taste wasn't that strong, and the chocolate pie crust was near tasteless. I'm not sure if that was because of my burnt mouth, if it was because pie had been frozen, or it just wasn't that flavourful to begin with. I left the 2nd pie out on the counter to thaw a bit (though it was missing a bite), as I didn't want to heat it up after the bad experience with the first one. After it wasn't frozen solid I tried it again, and I much preferred it over the heated one. The slightly cool crust and shell made it taste more like a cake than a pie, and not only could I now taste the mint filling, but I could also taste the chocolate in the crust. 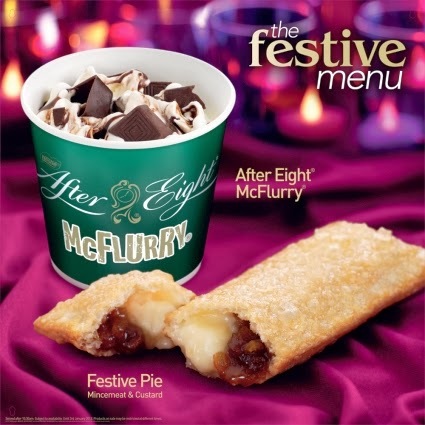 It made me think of how awesome it would be if they had an After Eight McFlurry, and it looks like the UK already fulfilled my dream...How great (read:terrible) does that Mincemeat and Custard Pie sound! I wish I could have given that a try. I love this blog but don't read it that often. I wish I had read it more recently because I live in the UK and could have sent you one of those pies. Anything else you want I will try and get you it if you want. And a mince pie in Winter if they have them again.